Romance is in the air this time of year. And if you’re looking for romantic things do in Oklahoma City with your other half, we have a great list of ideas for places for couples to spend some quality time, investing in their relationship. Whether you are adventurous, laid back, outdoorsy, or just looking for something a little out-of-the-box, this list will help you plan an incredible romantic getaway – whether you are traveling or live right in Oklahoma City. 1. 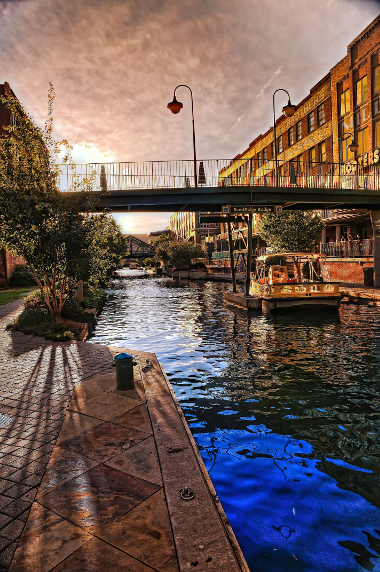 Bricktown Water Taxi – You may have heard a lot about Oklahoma City Bricktown but our favorite part is the Bricktown Water Taxi. With main dock located just off of Mickey Mantle drive, this river tour is sure to quickly become one of your favorites too. The taxi runs a continual service, much like a bus, and the Water Taxi Ambassadors narrate points of interest along the way. A round trip on the water taxi takes about 40 minutes, but you can ride for as long as you like because wristbands purchased are good for a full day. Of course if you have any other questions be sure to check out these FAQs. The Bricktown Water Taxi also serves as a direct connection to the Oklahoma River/Boathouse District! 2. Boathouse District – If you’re ready for a little action as a side dish to your romance, look no further than the Boathouse District. There are so many activities to explore that you’re sure to find something you’ll love. From stand-up paddle boarding to zip line and swing that go out over the river, from stunt jumping to the world’s largest slide, the adventures abound in the boathouse district. Passes are good for two days to make sure you have time to experience all of the excitement you can. 3. Hey Day – Maybe you’ve got a bit of a competitive itch that needs to be scratched? Hey Day will help you scratch that itch with all kinds of games – like mini golf, laser tag, even trivia – so you can have fun or be a little competitive (or even a lot competitive). You can go head-to-head with your sweetheart or invite other couples along to see who comes out on top. There are several locations so you can pick the best one for your itinerary. 4. Will Rogers Park – After all that action, you’ll be ready to stop and smell the roses – literally – in the Will Rogers Park. This beauty is one of the city’s best kept secrets and is one of the oldest city parks. It includes the Ed Lycan Conservatory – housing cacti and succulents, the Charles E. Sparks Rose Garden – with over 85 varieties of roses in bloom from April through October, the Margaret Annis Boys Arboretum – 10 beautiful acres with over 100 different types of trees, and the Will Rogers Garden Exhibition Center – home of many educational opportunities. 5. The 1903 Henry Overholser Mansion – Getting a glimpse into our past can really help appreciate our present and plan as we look to the future. The Henry Overholser Mansion is an amazing piece of history currently being preserved by Preservation Oklahoma. Henry Overholser is considered by many to be the father of Oklahoma City. 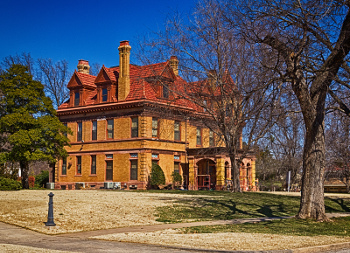 In Oklahoma’s first mansion that he and his wife built, there has passed many historical and social events of Oklahoma City. The house is now owned by the Oklahoma Historical Society and is listed on the National Registry of Historic Places. Tours are available on the hour or of course, you can explore this piece of history on your own. 6. Pinot’s Palette – Grab a glass of your favorite vino and prepare to become an artist. At Pinot’s Palette, local artists guide you step-by-step on creating your very own masterpiece. In this upscale “sip and paint” venue, you can sit back, relax, grab a brush and embrace some creative time with the one you love. Be sure to check out the calendar for paintings and class availability. 7. Michael Murphy’s Dueling Pianos Bar – And since every one is tired of the same old song and dance when it comes to the club scene, you’ll definitely want to check out Michael Murphy’s Dueling Pianos Bar. Dueling pianos are no joke – three rotating musicians take requests from guests and can play over 1000 songs and have been gathered from all around the country for their musical talent – including the ability to play at least three instruments! And the fun isn’t just in the music – guests get to have a drink and relax while listening to some fun roasts of other guests and their song choices. These romantic things to do in Oklahoma City are sure to help you and your significant other reconnect. And the cherry on top of this time together is a relaxing and cozy stay at the Montford Inn. Located just a short 20 minute drive from most of Oklahoma City, our Oklahoma City bed and breakfast, gives you access to the thrills of the city while offering you the quiet and peaceful night away you’re looking for. Montford Inn has ten amazing rooms – each with a fireplace and other cozy amenities. And to kick the romance up a notch, check out the six private cottages – each with fireplace, whirlpool tub, and screened-in porch. And if that’s not enough to beckon you out to the cottages, just remember that breakfast will be delivered right to your door in the morning. We look forward to being a part of your Oklahoma City romantic experience. You can start planning it right now. Photos by Lane Pearman and Kool Cats Photography.